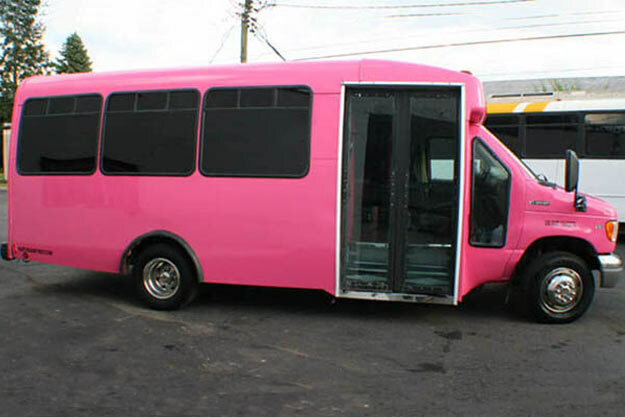 We have the nicest pink party bus you will find. Not only does it have a pink exterior but also a Pink/black/white/purple custom interior. The bus has custom leather seating. It has exotic hardwood flooring with a stripper pole in the middle of the floor. The sound system has two 12" subwoofers and two 6x9 sets. It has a DVD player and a 32" TV. The bus has two bar tops with built in coolers that glow. The ceiling has color changing led lights with custom shapes. If you're not near the Detroit area but happen to be traveling in the windy city get a Chicago Party Bus from a highly recommended party bus company. In California we recommend Party Bus San Diego, Party Bus Los Angeles, and Party Bus San Francisco.